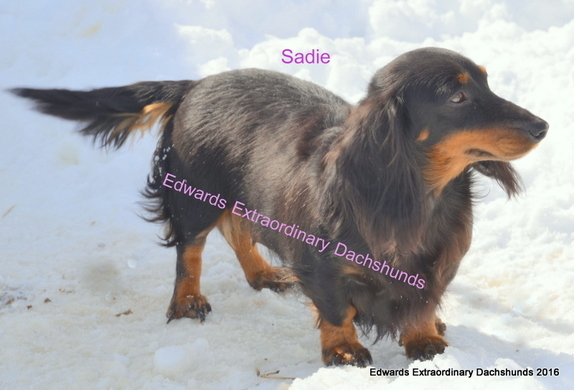 We do not always know what "month/date" they are available but we do have females & a male that typically retire or are just not being used in our breeding program and will be available along the way as pets. Prices are as a PET. We do not believe animals should be gifts or presents (especially not an adult dog!) ever. ("ESPECIALLY" when looking at adopting from us). We will not and/or do not adopt out to, through or for a third party in any way! You will see that mentioned more than once because we seem to be having trouble get some people to understand what we are meaning or trying to say. The person who we hand our dog or dogs to is the person or persons that was approved to adopt the dog. if you are wanting to look into adopting a Adult or teenager from us. It is EXTREMELY difficult for us to find the time to fill in all the little details on each and every adults and or teenagers bio that are available in this section of the page - like , if one likes a bath, toe nails clips etc.. As avail-abilities changes "all" the time! So we touch more on the important traits in each babies personal bio below. Please use the "Purchase requirements" page to help you submit information to us. No information is to much information! Please go into extra details about everything in your world. We do not adopt any of our adults until we have all of our questions answered and we "all" feel it is a "perfect" match!!! That is what is best for our babies, you and us. We do not try and see if they will work. If we are given "ALL" the information as requested we will be able to tell you who will work or not. ​Perfect family match and placement is "ALL" we care about! We are very proud to say in 10 years of placing all age babies (8 weeks old to 9 years old) we have only had '1" come back and that was because of a divorce in that family! WE KNOW everything about our babies. It is important that they are shared with the perfect home. By you doing your part and telling us EVERYTHING about you and the whole family around or involved tells us who will or "might" work for "you" that we have available now, later or soon. These are our babies (we call of them "babies" no matter what age they are) so we know them pretty much like a book and will know after you do your part if you might be a match for a couple of them now or for one coming up soon. Occasionally there has been one adopted out that really never even made it to this page "list as available" because the potential adopter did "ALL" the work way ahead of time and we knew who would work and be a perfect fit ahead of time and tell them then who it is. We will and do not adopt out to or through or for a third party in any way! All of ours use a dogie door to go out and do there potty business as needed. So not having a dog buddy to help show him or her the ropes and learn to go to the human door when he or she needs to do there business, will be a challenge for any of them in the beginning. Most of them are not typically lose in the whole house, so we would wrongly say they are house broken when they are not typically running through the whole house. Patience and dedication will get good results. No matter what age they are as an Adult that is going to be a difficult situation doing the potty training without the help of a dog buddy that already knows the rules or a very patient dedicated human that is home a whole LOT or ALL the time. We are not trying to discourage anyone in any way at all, we are very up front and honest people that want everyone to be happy. And ultimately try to avoid any undo stress for our babies. We always want the new forever home to work! In 10 years in placing all of our pups and adults we have only had 1 return (and that was because of a divorce). We contribute that to the fact that we are extremely thorough in making sure our babies (no matter what age they are we call them baby) go to the right forever home. Right home simply means that all situations are talked about up front and everyone involved is completely aware of what they are getting into or dealing with. We do not sugar coat anything about what a dogs corks are because it is VERY important they go to the right forever home. They are up to date on shots and wormings. Our babies also do not know what stairs are. We do not ship our adults. We DO NOT PLACE any of our babies with a third party to take to someone else for placement. PLEASE take your time and tell us everything we need to know to make a proper placement (the more information the better). We understand we want and require a LOT of information and in depth details. And really do not want to come across in anything we do or say to sound insensitive or harsh. We take what we do very seriously and just really can not apologies for that seriousness. If you feel that we are just wanting to much information, then it really in yours and our best interest that you look somewhere else. We will not and/or do not adopt out to, through or for a third party in any way what so ever! We will only hand over our babies directly to the person that was approved to adopt our baby. Cream (chocolate based), short hair, 12 lbs. Barney is very laid back and but really doesn't do much. lol. Just has always hung out, well that is what he still pretty much likes to do now. Has never really played with dogs or people (just who he is). Very quiet personality kind of weird sometimes how he will stay perfectly still and ridged like a statue and emotionless (lol). If you want a lap dog then pick him up and there is where he will be, don't know how long he will stay there thou. He has a mind of of his own like them all. Many people out in the world have adopted Barney babies over the years know he produced amazing family loving dogs. That is who he is. Because he was a breeding dog for 5 years, we do not think he would work with another male in the home. Spayed female no issue. Barney has been with us since he was 8 weeks old. As all of them are, he is up to date on all his shots and wormings. If interested or have any questions please call or email. page to help you submit information to us. Tell us about the family home you are offering for Barney. Thanks. to help you submit "all" the information to us needed. No information is to much information! We do not adopt any of our adults until we have all of our questions answered and we "all" (both families) feel it is a "perfect" match!!! ​Perfect family match and placement is all we care about! Adult or teenager from us. Red , brindle, long hair, 12 lbs. Peanut is and has always been extremely loving and friendly, loves to chew on his nylabone, snuggle big time in anyone's lap, and still like plays a little bit too sometimes (some with dogs and people) but not often. Very easy going. Will sit on your feet all day if you let him. Can very easily be classified as being a little bit of a goof ball or a clown when he was younger and immature (he was a slow maturer. lol). Actually took him "many" years to mature as he cared more about goofing off then anything else. lol. He is a big time LOVER boy! He does not care about being with other dogs or not. He just loves to be loved on. Only negative thing we could think to say about him is he is a food hog! and does not share his food very well. He has used a dog door for his whole adult life. Peanut has lived with us since he was a 8 weeks old. Tell us about the family home you are offering for Peanut. Thanks. Black & Cream, dapple, long hair, 14 lbs. Mr. fluff ball Cagney is and has always been loving and friendly but he does sometimes play a game of backing away from you when you go to touch or pick him up (but then comes right back). That silliness he has done for years. And he is not being shy, he is just clowning off! He has never had an issue or a negative attitude with or toward any other dog he has been with for all the years we have had him. Basically is pretty easy going buddy. If he was a human he would have a smile all day long. We really do not have anything negative to say about him. He is like a LOT of our babies and is just a big baby doll and wants attention. He is big time lover boy! Because he was a breeding dog for almost 5 years, we do not think he would work with another male in the home. Spayed female no issue. Tell us about the family home you are offering for Cagney. Thanks. cream, long hair, 14 lbs..
Pearl is slightly shy sometimes but not a real big deal. Does get a little nervous around overly active children even though she likes them (probably best for an older children family then younger). She would also be in heaven if she was the only dog around and someone would be home with her all the time. Just loves to be loved on. More of a leaders personality with other dogs than a follower! She would prefer to be a lap dog than a play mate. Loves to follow you around and sit and/or lay down and wait for you to rub her face, neck, chest, back and tummy for hours. She has lots of patience but does not like aggressive nothings in her world or she will walk away. She was an amazing caring, nurturing, loving mommy (a little protective but not to much to make it ugly). ​She has retired and is ready for a caring loving dedicated forever home to continue pampering her. As all of them are, she is up to date on all her shots and wormings. Tell us about the family home you are offering for Pearl. Thanks. 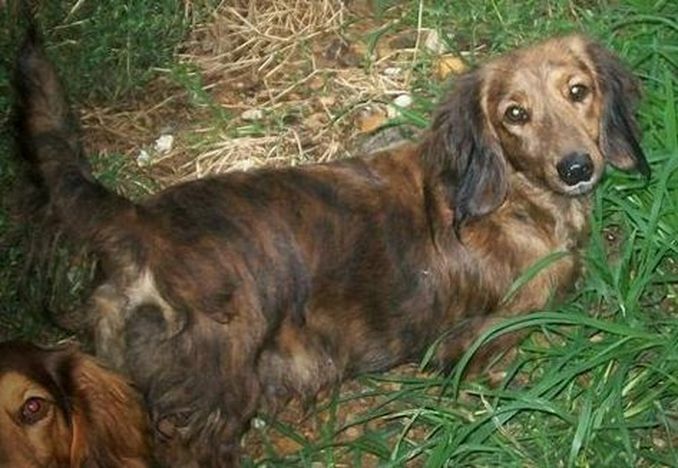 chocolate & tan, long hair, dapple. 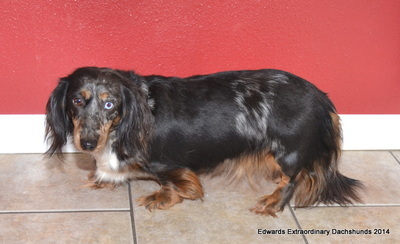 We are placing this 7 year old chocolate & tan dapple (with one blue eye) long hair up for adoption. Cassidy is about 14 lbs. and is an awesome young lady. She is pretty friendly but can be stand offish. There is nothing wrong with her at all (that we are aware of ). She is however an alpha female but gets along with all the boys and most other dogs as long as they are not an alpha at all. Once she knows you are her friend she loves you. She really is a sweet heart, but you have to work for it sometimes. Unfortunately she can come across as being not sociable and untrusting because she has this reserved side and sits back and just watches sometimes (that is just her). Has never done anything to warrant being concerned, it is just a look she has so we do not trust her, it is just that simple (just a look she has)! We do not really think she would be a great fit for children that want her to play she has no interest in that at all. She might also be a better fit for a family/home that does not have other dogs and especially if they are needing to compete for attention. So that there is not an issue or concern we really would rather see her go to a home with no other pets. She'll do better with a secure quiet handler. She is micro'chipped and spayed. Has used a dogie door for a couple years to go out and do her business as she needs to. So not having a dog buddy to help show her the ropes and learn to go to the human door when she needs to do her business, will be a little challenge for her. Patience and dedication will get good results. No matter what age they are as an Adult that is going to be a difficult situation doing the potty training without the help of a dog buddy that already knows the rules or a very dedicated human that is home all the time. We are not trying to discourage anyone in any way at all, we are very up front and honest people that want everyone to be happy. And ultimately try to avoid any undo stress for our babies. We always want the new forever home to work. In 8 years in placing all of our pups and adults we have only had 1 return. We contribute that to making sure our babies go to the right home. Right home simply means that all situations are talked about up front and everyone involved is completely aware of what they are getting into. We do not sugar coat anything about what a dogs corks are because it is VERY important they go to the right forever home. Up to date on all her shots and wormings. Tell us about the family home you are offering for Cassidy. Thanks. 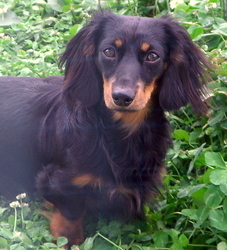 Chocolate (solid), long hair, 16 lbs. Oh Charlie, Charlie. lol Where to start. Well, he was kept from Georgia & Peanut litter as Peanut was getting ready to retire. But the size gene came through from somewhere else so here we are. We are and were soooo disappointed as he would not stop growing . lol He is such a handsome fluff ball. We just don't want to get into raising tweenies as clearly what he is and would most likely pass on his size. Charlie has got an amazing personality and is puppy at heart and LOVES to play and will snuggle as well if that is what you want. Like everyone else he is using a dogie door. Extremely friendly, so far has gotten along with everyone he has been with. Being a puppy at heart he still has some maturing to do as his dad Peanut took a couple years before he was fully mature mentally (but that's what makes him him and special at that). He will follow you around and will run around you too to invite you to play. Tell us about the family home you are offering for Charlie. Thanks. Red, short hair, 11 lbs. Rosie is a slight shy side sometimes but not a real big deal. Does get a little nervous around overly active children even though she loves them. We think she would be happiest in a home where children are not looking for a play toy dog and the home is laid back and a quiet atmosphere. More of a submissive personality with other dogs and a follower. She would prefer to be a lap dog than a play mate. Loves to follow you around and lay on her back wait for you to rub her belly. She has lots of patience but does not like aggressive nothing or anything (she will yelp and walk away). She is just to quiet of a personality to handle that type of behavior. Black & tan, long hair. Chocolate & cream, long hair. We are placing this 4 year old red piebald short hair up for adoption. Holly is one of our baby girls weighing in about 12 lbs.. She is a real sweet heart and friendly but she just can not seem to get it in her head that we are all her friend as she constantly will walks away from you. Always has been that way. She has not been with kids much but we do not see why that would be an issue as long as everyone is mature enough to have patience with her all the time. Gets along with other dogs very well but at the same time she is not a door mate and would not allow an alpha male or female to walk all over her. More of a follower than anything. Holly is a real sweet heart and gets along with all dogs that she has been with over the years. She would rather run from any confrontation then be a part of it. She has never showed any signs at all of being aggressive at all. She does get scared if you drop something around her and runs away a few feet and then comes back to see what happen. Just the way she has always been. She really would be best to go to a quiet forever home that does not have a such a busy life to not have time to work with some of her challenges. Because of what we described about her we can not say that she doesn't have any corks or special needs because she really does. lol A real sweet heart, just weird habits/behavior at the same time. ​There is nothing wrong with her at all (that we are aware of ). Has been micro-chipped. ​She has not been spayed at this time. She has used a dogie door for a couple years to go out and do her business as she needs to. So not having a dog buddy to help show her the ropes and learn to go to the human door when she needs to do her business, will be a challenge for her. Patience and dedication will get good results. No matter what age they are as an Adult that is going to be a difficult situation doing the potty training without the help of a dog buddy that already knows the rules or a very dedicated human that is home all the time. We are not trying to discourage anyone in any way at all, we are very up front and honest people that want everyone to be happy. And ultimately try to avoid any undo stress for our babies. We always want the new forever home to work. In 8 years in placing all of our pups and adults we have only had 1 return. We contribute that to making sure our babies go to the right home. Right home simply means that all situations are talked about up front and everyone involved is completely aware of what they are getting into. If interested or any questions please call or email. In writing please also tell us about the family/home you are offering for Holly. Please use the "Purchase requirements" page to help you submit information to us. We are placing this 4 & half year old black & tan long hair up for adoption. Sadie is one of our baby girls weighing in about 12 lbs. and is an awesome young lady. She is very very friendly, easy going, loving, very much a people dog, loves everyone so she is not much of a guard dog. She has not been with kids much but we do not see why that would be an issue, being she seems to love everyone. There is nothing wrong with her at all (that we are aware of ). She is a great dog and she will be very easy to place because she has no corks or special needs. She loves everyone in her world. Wiggles all over and wags her tail like crazy when she hasn't seen you for a few minutes! Gets along with other dogs very well but at the same time she is not a door mate and would not allow an alpha male or female to walk all over her. Very loving and laid back personality. In writing please also tell us about the family/home you are offering for Sadie. We are placing this 1 year old cream short hair up for adoption. Gem is an absolute sweet heart. Typical 1 year old puppy that wants to be in everyone's business. lol We had kept her and a long hair sister from the same litter to continue that line but Gem is just not going to be big enough (about 8 lbs.). She has just never grown out of her lean frame - at 14 months old now. So we are unfortunately going to have to place her in a pet home now and we will be requiring her to be spayed. She tends run her mouth if left outside for to long unattended! She is a little shy at first but very friendly, easy going, loving, very much loves everyone once she meets you and knows who you are. There is nothing wrong with her at all (that we are aware of ). She gets along with other dogs very well. Once she gets to know you she will be at your side, if you want her to follow you around. lol Just will take a little time to get her to know you of course. Sometimes she has no shortage of energy for her small lean frame and acts like a wind up energizer bunny. Maturity is still settling in. She has not been spayed. She has used a dogie door for about 8 or 9 months to go out and do her business as she needs to. So not having a dog buddy to help show her the ropes and learn to go to the human door when she needs to do her business, will be a challenge. Patience and dedication will get good results. No matter what age they are as an Adult that is going to be a difficult situation doing the potty training without the help of a dog buddy that already knows the rules or a very dedicated human that is home all the time. We are not trying to discourage anyone in any way at all, we are very up front and honest people that want everyone to be happy. And ultimately try to avoid any undo stress for our babies. We always want the new forever home to work. In 9 years in placing all of our pups and adults we have only had 1 return. We contribute that to making sure our babies go to the right home. Right home simply means that all situations are talked about up front and everyone involved is completely aware of what they are getting into. If interested or any questions please email. Please also tell us everything about the family home you are offering for Gem. Thanks. "Purchase requirements" page is what we require of every forever home to do. We are placing this 4 year old black short hair up for adoption. Ebony has been with us since birth, weighing in about 12 lbs. and is an awesome young lady. She is friendly, easy going, loving, very much a people dog, loves everyone once she meets you and knows who you are. There is nothing wrong with her at all (that we are aware of ), we just simple can not keep all of them. So unfortunetely we tend to adopt out all the good ones. lol She had a couple of litters for us and was a great Mommy. She is a great dog and will be pretty easy to place because she has no corks or special needs. She loves everyone in her world once she knows ya. She gets along with other dogs very well. Ebony is one our social lovers! Once she gets to know you she will be at your side, if you want her to follow you around. lol Just will take a little time to get her to know you of course. Once she is comfortable she is still pretty out going. She has used a dogie door for about a year to go out and do her business as she needs to. So not having a dog buddy to help show her the ropes and learn to go to the human door when she needs to do her business, will be a challenge. Patience and dedication will get good results. No matter what age they are as an Adult that is going to be a difficult situation doing the potty training without the help of a dog buddy that already knows the rules or a very dedicated human that is home all the time. We are not trying to discourage anyone in any way at all, we are very up front and honest people that want everyone to be happy. And ultimately try to avoid any undo stress for our babies. We always want the new forever home to work. In 8 years in placing all of our pups and adults we have only had 1 return. We contribute that to making sure our babies go to the right home. Right home simply means that all situations are talked about up front and everyone involved is completely aware of what they are getting into. Please also tell us everything about the family home you are offering for Ebony. Thanks. Blue & tan, long hair. She has not been spayed at this time. She has used a dogie door for about 4 year to go out and do her business as she needs to. So not having a dog buddy to help remind her to go to the human door when she needs to do her business, will be a little bit of a challenge. Patience and dedication will get good results. She did use a human door for the first year of her life so it shouldn't take forever for her to remember what to do or not do. No matter what age they are as an Adult that is going to be a difficult situation doing the potty training without the help of a dog buddy that already knows the rules or a very dedicated human that is home all the time. We are not trying to discourage anyone in any way at all, we are very up front and honest people that want everyone to be happy. And ultimately try to avoid any undo stress for our babies. We always want the new forever home to work. In 8 years in placing all of our pups and adults we have only had 1 return. We contribute that to making sure our babies go to the right home. Right home simply means that all situations are talked about up front and everyone involved is completely aware of what they are getting into. We are placing this 3 year old cream, dapple (faded out some) long hair up for adoption. Gidget has been with us since she was 6 months old, weighing in about 9 lbs. and is an awesome young lady. She is friendly, easy going, loving, very much a people dog, loves everyone once she meets you and knows who you are. There is nothing wrong with her at all (that we are aware of ), we just simple can not keep all of them. So we tend to adopt out all the good ones. lol She had a couple of litters for us and was a great Mommy. 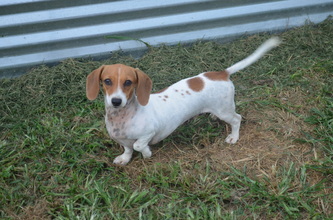 She is a great dog and will be pretty easy to place because she has no corks or special needs. She loves everyone in her world once she knows ya. She gets along with other dogs very well. Gidget is one our social lovers! Once she gets to know you she will probably live in your lap, if you want her to or follow you around. lol Just will take a little time to get her to know you. She does have a little bit of a reserved/timid side sometimes, but like most of them that is over come with time. Once she is comfortable she is still pretty out going. She has used a dogie door for about 2 years to go out and do her business as she needs to. So not having a dog buddy to help show her the ropes and learn to go to the human door when she needs to do her business, will be a challenge. Patience and dedication will get good results. No matter what age they are as an Adult that is going to be a difficult situation doing the potty training without the help of a dog buddy that already knows the rules or a very dedicated human that is home all the time. We are not trying to discourage anyone in any way at all, we are very up front and honest people that want everyone to be happy. And ultimately try to avoid any undo stress for our babies. We always want the new forever home to work. In 8 years in placing all of our pups and adults we have only had 1 return. We contribute that to making sure our babies go to the right home. Right home simply means that all situations are talked about up front and everyone involved is completely aware of what they are getting into. Below is a picture of Gidget. We are placing this 2 year old cream long hair up for adoption. Cashew is one of our baby girls weighing in about 9 lbs. and is an awesome young lady. She is friendly, easy going, loving, very much a people dog, loves everyone once she meets you and knows who you are. There is nothing wrong with her at all (that we are aware of ). She is a great dog and will be pretty easy to place because she has no corks or special needs. She loves everyone in her world once she knows ya. Sometimes she will flops on her back wanting her belly rubbed. She gets along with other dogs very well. Cashew is one our social lovers! Hate to have to place her so soon. We are just not comfortable with the weight she maintains to allow her to be bred. We will not put a moms body threw birthing if we do not feel they can handle the physical stress. We have given her 2 years and thicken up but that has never happen, so that is were we stand. Once she gets to know you she will probably live in your lap, if you want her to. lol Just will take a little time to get her to know you. She does have a little bit of a timid side sometimes. Please also tell us about the family home you are offering for Cashew. Thanks. Below is a picture of Cashew. 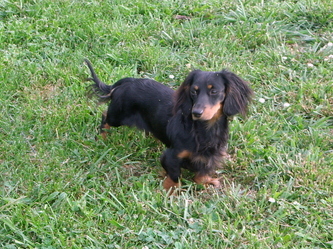 We are placing this 1 & half year old black & tan long hair up for adoption. 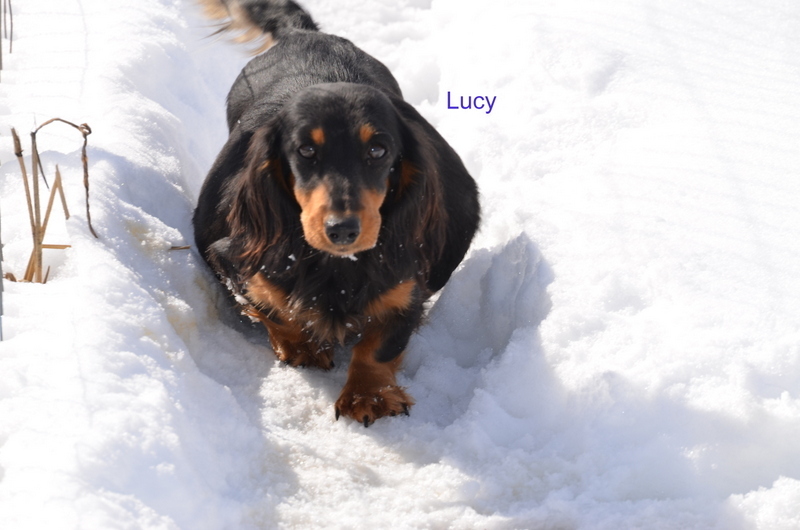 Lucy is one of our baby girls weighing in about 11 lbs. and is an awesome young lady. She is very very friendly, very easy going, loving, very much a people dog, loves everyone so she is not much of a guard dog. She has not been with kids much but we do not see why that would be an issue, being she seems to love everyone. There is nothing wrong with her at all (that we are aware of ). She had an issue birthing her 1st litter so we are not going to breed her anymore. She is a great dog and she will be very easy to place because she has no corks or special needs. She loves everyone in her world. Wiggles all over and wags her tail like crazy when she hasn't seen you for a few minutes! Gets along with other dogs very well. Kind of a lazy girl. She has not been spayed at this time. In writing please also tell us about the family/home you are offering for Lucy. Thanks. We are placing this 2 year old red short hair up for adoption. 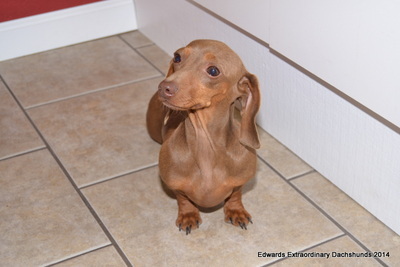 Ruby is one of our smallest girls at about 8 & 1/2 lbs. and is an awesome young lady. She is very very friendly, easy going, loving, very much a people dog, loves everyone so she is not much of a guard dog. lol. There is nothing wrong with her at all (that we are aware of ). 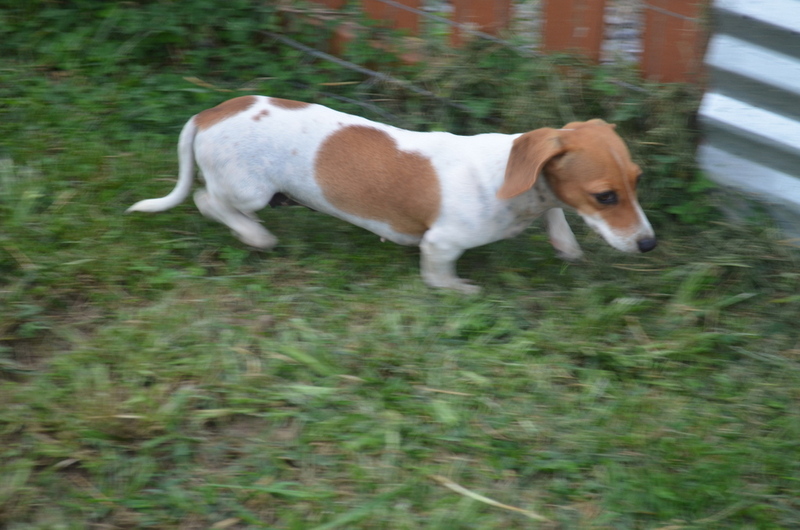 She is a great dog and she will be very easy to place because she has no corks or special needs. She loves everyone in her world. Flops on her back wanting her belly rubbed or sits on your feet until you give her love. She gets along with other dogs very well. Ruby is one our sweet lovers! Hate to have to place her so soon. 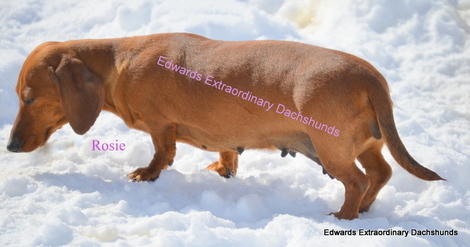 She is a "great" mom and did fantastic birthing pups. But that being said, she unfortunately takes after her Mom (who we bred once and retired after that first litter as well) and does not maintain her weight to our standards while caring for her pups. We will not put a moms body threw birthing again if they show any signs of physical stress. So that is were we stand. Not a mean bone is her body. Will probably live in your lap or purse if you could live that type of life. She does have a little bit of a timid side. She has not been spayed at this time. She has used a dogie door for a couple years to go out and do her business as she needs to. So not having a dog buddy to help show her the ropes and learn to go to the human door when she needs to do her business, will be a challenge. Patience and dedication will get good results. No matter what age they are as an Adult that is going to be a difficult situation doing the potty training without the help of a dog buddy that already knows the rules or a very dedicated human that is home all the time. We are not trying to discourage anyone in any way at all, we are very up front and honest people that want everyone to be happy. And ultimately try to avoid any undo stress for our babies. We always want the new forever home to work. In 7 years in placing all of our pups and adults we have only had 1 return. We contribute that to making sure our babies go to the right home. Right home simply means that all situations are talked about up front and everyone involved is completely aware of what they are getting into. Please also tell us about the family home you are offering for Ruby. Thanks. Below is a picture of Ruby with her pups. 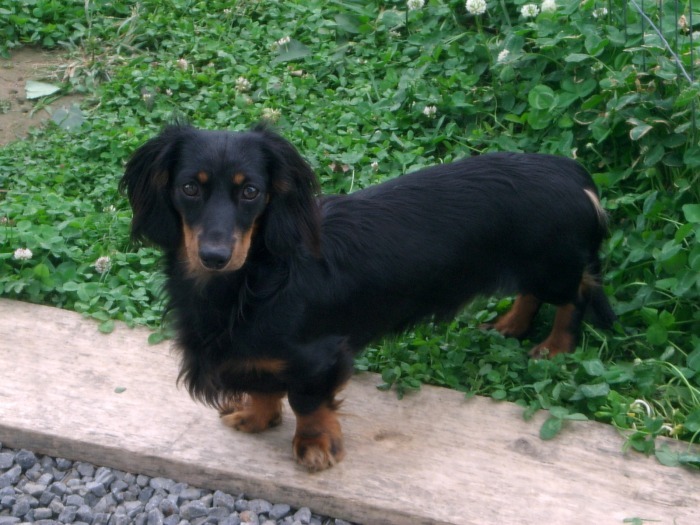 black & tan, long hair, dapple. 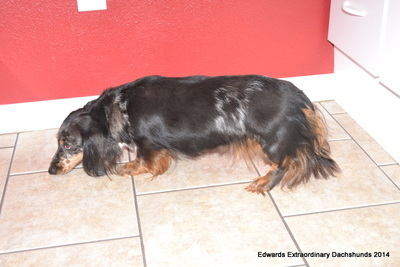 We are placing this 4 year old black & tan dapple long hair up for adoption. Sammi is a big girl a about 16 lbs. and is an awesome young lady. She is very very friendly, easy going, loving, very much a people dog, loves everyone so she is not much of a guard dog. She has been with kids with no issues. There is nothing wrong with her at all (that we are aware of ). She is a great dog and she will be very easy to place because she has no corks or special needs. She loves everyone in her world. Flops on her back wanting her belly rubbed. She gets along with other dogs very well. As easy going as she is she will not tolerate a alpha female trying to dominate her thou. She has been micro-chipped. She has not been spayed at this time. She has used a dogie door for a couple years to go out and do her business as she needs to. So not having a dog buddy to help show her the ropes and learn to go to the human door when she needs to do her business, will be a challenge for her. Patience and dedication will get good results. No matter what age they are as an Adult that is going to be a difficult situation doing the potty training without the help of a dog buddy that already knows the rules or a very dedicated human that is home all the time. We are not trying to discourage anyone in any way at all, we are very up front and honest people that want everyone to be happy. And ultimately try to avoid any undo stress for our babies. We always want the new forever home to work. In 6 years in placing all of our pups and adults we have only had 1 return. We contribute that to making sure our babies go to the right home. Right home simply means that all situations are talked about up front and everyone involved is completely aware of what they are getting into. Please also tell us about the family home you are offering for Sammi. Thanks. We are placing this 2 year old red short hair up for adoption. Ellie is a about 10 lbs and sweet young lady. She is very friendly, easy going, loving, very much a people dog, loves everyone after she gets to know you. There is nothing wrong with her at all (that we are aware of ). She is a great dog but gets picked on sometimes because she is so easy going. She "will not" stand up for her self (she is just "not" a fighter). She does not really have any corks or special needs. She loves everyone in her world once she knows you. Generally she will just stand back at first until she is comfortable with you, then she is fine. Likes a lot of things but loves being held and also loves her chest scratched. She has been bred in the past but has not taken. At this time she has not been spayed. She has used a dogie door for a couple years to go out and do her business as she needs to. So not having a dog buddy to help show her the ropes and learn to go to the human door when she needs to do her business, will be a challenge for her. Patience and dedication with get good results. No matter what age they are as an Adult that is going to be a difficult situation doing the potty training without the help of a dog buddy that already knows the rules or a very dedicated human that is home all the time. We are not trying to discourage anyone in any way at all, we are very up front and honest people that want everyone to be happy. And ultimately try to avoid any undo stress for our babies. We always want the new forever home to work. In 6 years in placing all of our pups and adults we have only had 1 return. We contribute that to making sure our babies go to the right home. Right home simply means that all situations are talked about up front and everyone involved is completely aware of what they are getting into. Please also tell us about the family home you are offering for Ellie. Thanks. ﻿We are placing this almost 2 year old chocolate & tan dapple long hair up for adoption. Cody is a about 12 lbs. and is an awesome young gent. He is friendly, easy going, kind of in the middle as far as personality goes and likes to be with the other dogs as much as people. There is nothing wrong with him (that we are aware of ). We feel he is a little immature for his age and at times can be a little shy. But is not happy if he can not see what is going on. He stays to himself and with the other dogs a lot, likes people but just will not run over to you on his own. He is one of our own from Mason and Cassidy 2013 litter. He is micro-chipped but not neutered yet. Up to date on all him shots and wormings. Please also tell us about the family home you are offering for Cody Thanks. 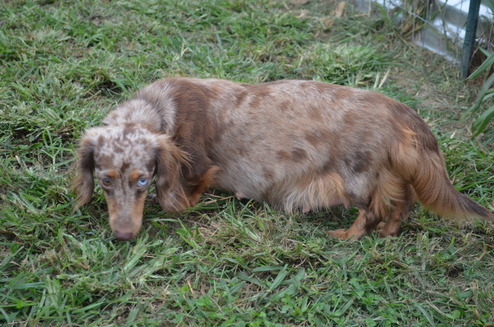 chocolate & tan, shorter long hair, brindle, piebald. We are placing this 11 month old, shorter long hair, 6 lb., chocolate & tan, piebald, named Reese, female up for adoption. Her body just does not want to fill out enough to be considered safe to breed. We kept from Pyper & Peanut litter from February 14, 2014 (Valentine day) with intentions to add her to our breeding program. But that is not going to happen. She is staying to small framed and has a thinner frame then we like to breed. So we are going to go ahead and place her into her forever " pet " home. A REAL sweet heart all the time, just a little shy at first, but is very loving & friendly young lady once she gets to know you. She does like to play but just takes her time. Always wants to be with the humans if you are around. Getting ready to start potty training with a dogie door. We see no reason why she couldn't be a family pet with children. She also gets along with other dogs very well. She loves one on one attention but will not fight to be first in line so a single person home would work good or a forever home with other gentle dogs. 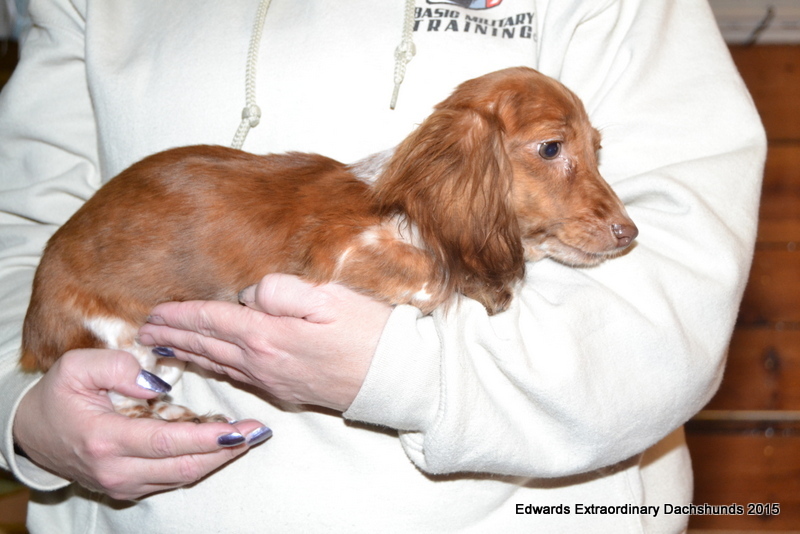 She has not had her first heat cycle yet and is not spayed. We always want the new forever home to work. In 6 years in placing all of our pups and adults we have only had 1 return. We contribute that to making sure our babies go to the right home. Right home simply means that all situations are talked about up front and everyone involved is completely aware of what they are getting into. Please also tell us about the family home you are offering for Reese. Thanks. chocolate & tan, long hair. 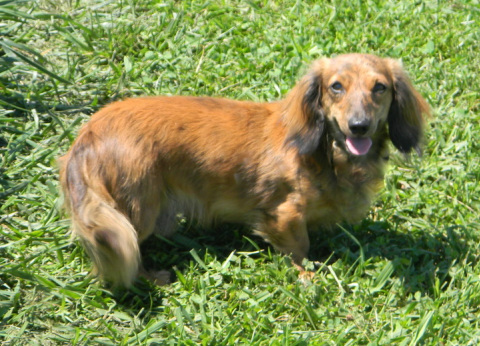 We are placing this 3 year old chocolate & tan long hair up for adoption. Sawyer is a big boy at about 14 lbs. and is an awesome young gent. He came to us as a young adult from another breeder and he matured bigger then we like to breed and unfortunately passes his size on as well. So we are going to place him now to his forever home. He is friendly, easy going, loving, but is not much of a guard dog. There is nothing wrong with him (that we are aware of ). He is micro-chipped but not neutered yet. He is pretty quiet most of the time and keeps to himself a lot. He does like to be loved on thou. He just does not come to you on his own most of the time. He has used a dogie door for years to go out and do his business as he needs to. So not having a dog buddy to help show him the ropes and learn to go to the human door when he needs to do his business, will be a challenge for him. No matter what age they are as an Adult that is going to be a VERY difficult situation doing the potty training without the help of a dog buddy that already knows the rules or a very dedicated human that is home all the time. We are not trying to discourage anyone in any way at all, we are very up front and honest people that want everyone to be happy. And ultimately try to avoid any undo stress for our babies. We always want the new forever home to work. In 6 years in placing all of our pups and adults we have only had 1 return. We contribute that to making sure our babies go to the right home. Right home simply means that all situations are talked about up front and everyone involved is completely aware of what they are getting into. Please also tell us about the family home you are offering for Sawyer. Thanks. 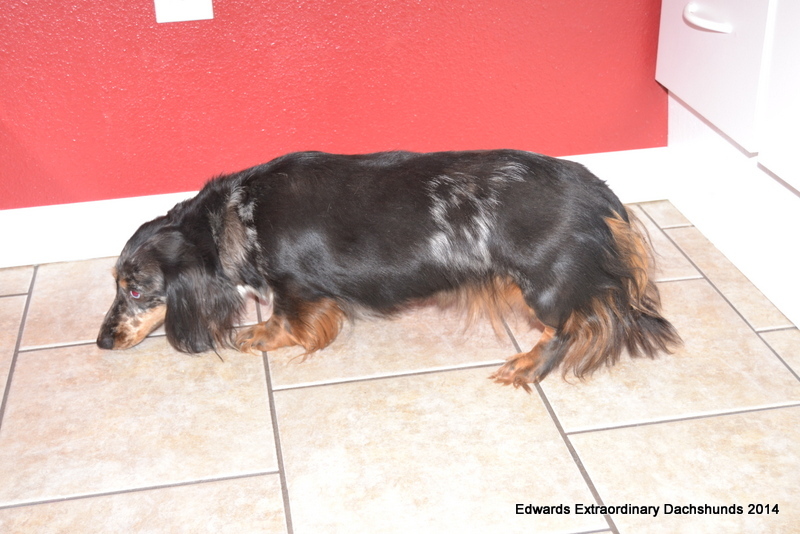 We are reluctantly placing this 4 year old, long hair, 13lb., black & tan, named Elvis for sale. He has not been neutered yet. He just never wanted to be a breeding stud. He will make an outstanding family pet. He is VERY easy going, mellow, loving and loves everyone all the time. Comes running when you call his name and is potty trained with a dogie door. We see no reason why he couldn't be a family pet with children. He also gets along with other dogs great. Being able to go outside is a big deal to us because our babies get to go out in the yard anytime they want and they LOVE it. The only issue Elvis has ever had is dry skin and would scratch uncontrollably, has been treated for it before and it usually stays at bay. He won't jump in your lap but he will beat his tail to death waiting for you to put him in your lap. We do not sugar coat anything about what a dogs corks are because it is VERY very important they go to the right forever home. We are very up front and honest people that want everyone to be happy. And ultimately try to avoid any undo stress for our babies. We always want the new forever home to work. In 6 years in placing all of our pups and adults we have only had 1 return. We contribute that to making sure our babies go to the right home. Right home simply means that all situations are talked about up front and everyone involved is completely aware of what they are getting into. Up to date on all his shots and wormings. Please also tell us about the family home you are offering for Elvis. Thanks. short hair, chocolate & tan. 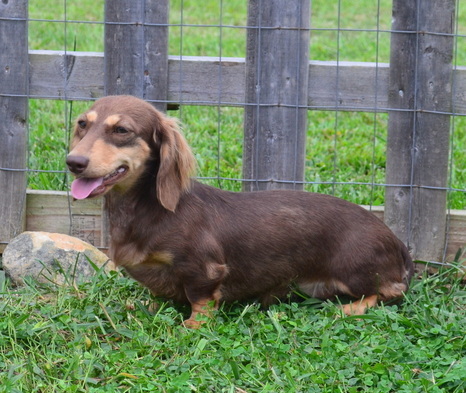 We are reluctantly placing this 20 month old, short hair, 8 lb., chocolate & tan, named Katie, for sale. She has not been spayed yet. We kept her from one of our litters earlier last year in hopes to add her to our breeding program, but her body frame just wants to stay very little and be a family pet now instead of later. She is an absolute doll and a real sweet heart all the time and loves everyone. Comes when you call her name and is potty trained with a dogie door. We see no reason why she couldn't be a family pet with children. Do know if she would be the best choice for very young children because she has a timid/chicken nature. She also gets along with other dogs great but on the same note she will not tolerate being bullied by another dog. Being able to go outside is a big deal to us because our babies get to go out in the yard anytime they want and Katie is one of them that does "all" the time (she LOVES the sun and fresh air). She did use pee pads up until she was about 5 months old. Katie's biggest issue is she is kind of a chicken and just sits a few feet back from anything new (people to) until she feels like coming closer. It does not matter what any of the other ones do or us. She just has a reserved timid nature and as sweet as they come in a very small package. Anything she is not use to will just walk away and watch from a little distance. She has never been one of the dogs that jumps in your lap. She just sits about a foot from you and waits for you to go to her and pick her up. Please also tell us about the family home you are offering for Katie. Thanks. 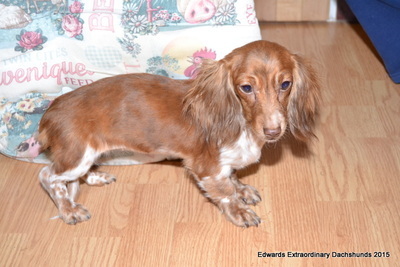 We are placing this 4 & half year old long hair cream lady up for adoption. She is retired now. Tequila is an awesome young lady and is very true to her cream heritage. She is very friendly, easy going, loving, very much a people dog, loves everyone so she is not much of a guard dog. There is nothing wrong with her at all (that we are aware of ). She is a great dog and she will be very easy to place. Ones like her we really love placing because they do not have any corks or needs that we need to be worried about. The only real concern we would have for Tequila is she is not a loner. She loves people and has never been alone a day in her life ( with a dog buddy or a human ). So that being said, we are not letting her go to a home that someone is not home all the time or does not have any other indoor pets. She is potty trained but she has used a dogie door for many years to go out and do her business as she needs to. So not having a dog buddy to help show her the ropes and learn to go to the human door when she needs to do her business, will be a challenge for her. No matter what age they are as an Adult that is going to be a VERY difficult situation doing the potty training without the help of a dog buddy that already knows the rules or a very dedicated human that is home all the time. We are not trying to discourage anyone in any way at all, we are very up front and honest people that want everyone to be happy. And ultimately try to avoid any undo stress for our babies. We always want the new forever home to work. In 6 years in placing all of our pups and adults we have only had 1 return. We contribute that to making sure our babies go to the right home. Right home simply means that all situations are talked about up front and everyone involved is completely aware of what they are getting into. Please also tell us about the family home you are offering for Tequila. Thanks. 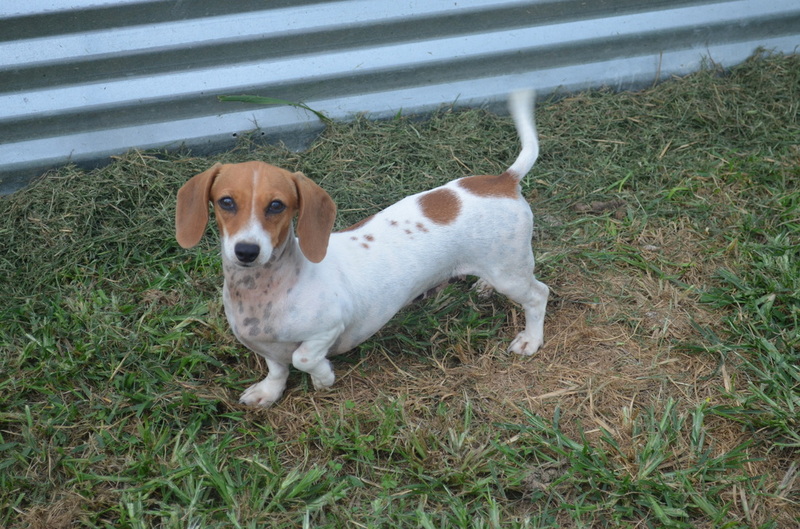 We are placing this 2 & 1/2 year old, short hair, 8 & 1/2 lb., red, piebald, named Peaches, spayed female up for adoption. Her body just wasn't designed to deliver pups so she has retired from being a Mommy and has been spayed and is ready to go to her forever " pet " home. A real sweet heart all the time, just a little shy at first. Comes when you call her name and is potty trained with a dogie door. We see no reason why she couldn't be a family pet with older children. She also gets along with other dogs very well. She loves one on one attention but will not fight to be first in line so a single person home would work good or a forever home with other dogs. She comes across as being stand offish and unfriendly at first, but truly is a sweet heart, loving & friendly young lady once she knows you. Please also tell us about the family home you are offering for Peaches. Thanks. 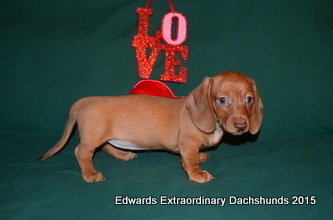 In the picture below Peaches is the Mommy of the litter. We are placing this 6 year old, true long hair, 15 lb., red, brindle, named Savannah, spayed female up for adoption. She has retired from being a wonderful Mommy and has been spayed and is ready to go to her forever " pet " home. 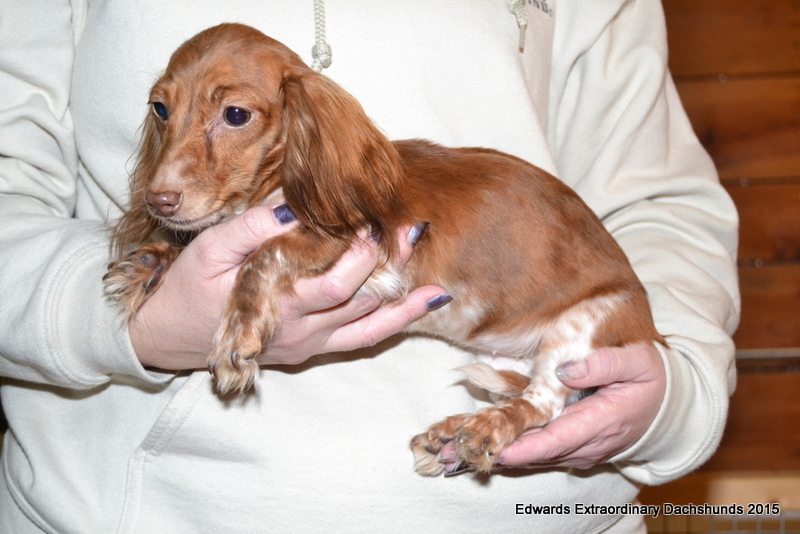 She weighs 15 pounds and is AKC registered. Potty trained with a doggy door and is crate trained. She is a sweet heart of a female and gets along with all the males and females. She is not going to let another dog push her around but she will not start something at all. 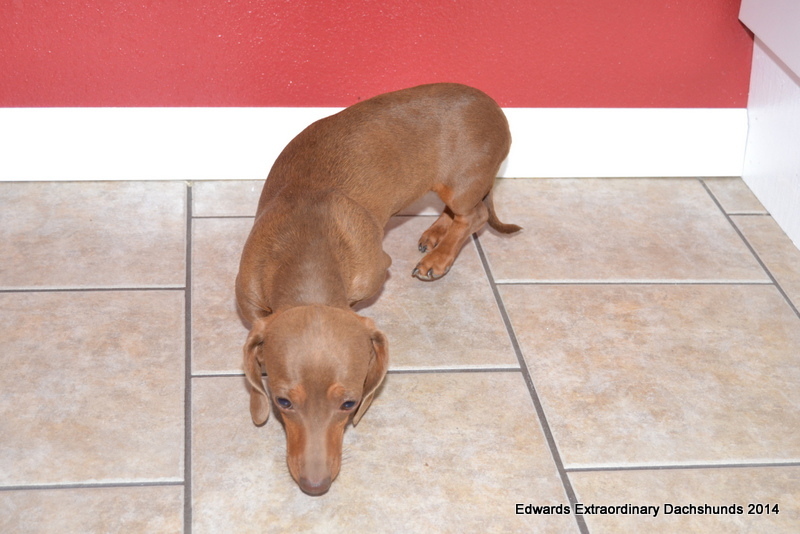 She does not like confrontation She is your typical female dachshund that just loves attention from everyone. If you are looking for a dog that is going to run around and jump in your lap, she is probably not the one for you. She does play once in a while with another dogs thou, just not everyday. She pretty much barks because something is wrong or has a good reason. She is just very easy to be around and love. As she gets to know you she will climb partly in your lap and let you love on her all day, but she is not going to jump in your lap like a puppy anymore. She has pretty much matured past the rough house playing stage and is very quiet and laid back lady who loves to be loved and likes to know what you are doing. She does not like surprises, so not sure if little children would be a good fit. She does however once in a while surprise you and come barreling in and running around a few laps and jumping up and down like she just got a B-12 shot. Hahaha And she will jump up and down when she knows you are getting her food ready to place on the ground. She loves to eat her food. She also really appreciates her bed time with a snuggle blanket, dogie bed, or her crate. She is a REAL snuggle'r ! We are more interested in her getting the right forever pet home, it is not about the money. Please also tell us about the family home you are offering for Savannah. Don't wait! And be sorry you didn't put a deposit down. A deposit holds a puppy until he or she is 8 weeks old. If Not picked up by that pick up date they will be put back up for adoption and deposit will be forfeited unless prior arrangements are made in writing. We charge $5.00 a day to hold a puppy past the first pick up date scheduled or $35.00 a week. A deposit is "NOT" accepted to hold one of our pups until we receive in writing who the deposit is going toward, contact phone numbers, who pup is for, etc. Also a response to our email confirming to our pick up date, spay or neutering, etc. is required. All of our puppies are sold as pets. Which means they will be spayed or neutered at the owners expense. 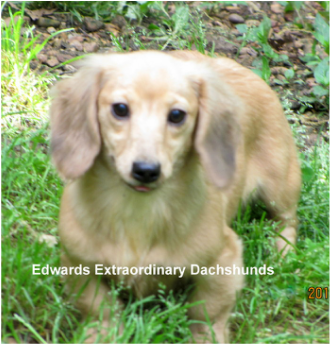 AKC " bred" means the puppy comes from AKC Registered parents, and is a pure blooded dachshund. Deposit are NON refundable - ﻿Occasionally﻿ they are transferable to another litter within the year.